Smoke moving across the U.S. August 10. We really are connected, man. 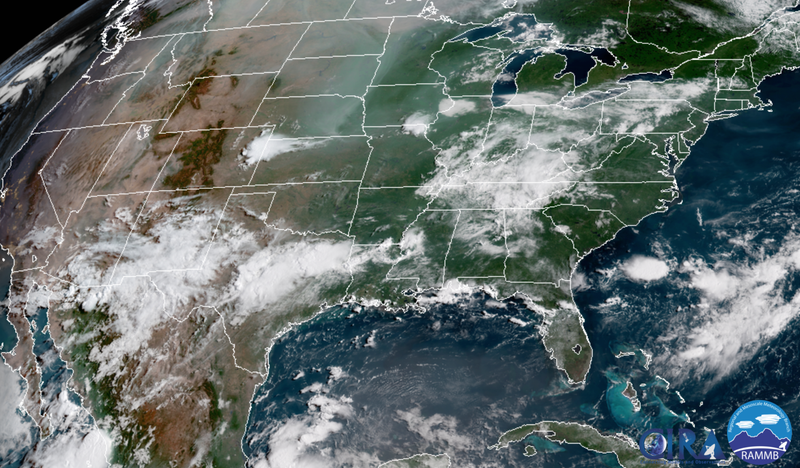 As of Wednesday, smoke from the record-breaking wildfires in California had made its way to the East Coast, according to the National Weather Service. Who knows how far it’s traveled by now. As wild as this sounds, movement of wildfire smoke across continents is pretty common. Look at Indonesia, where smoke from the massive 2016 peat fires wound up in halfway across the world. Just last year, smoke from fires out west reached countries in Europe. And this doesn’t just happen with smoke: Sahara dust hailing from North Africa readily makes its way to the Caribbean. While not smoke, this dust is another form of pollution that can become a problem for the people it meets along the way. Luckily, by the time wildfire smoke reaches far off distances—like 3,000 miles to New York, for example—it’s mixed with enough fresh air that it poses little health risk, according to Mashable. The same can’t be said for the smoke currently choking California and neighboring states. Smoke was already moving across state lines last week, causing air quality issues for people in Reno, Nevada. The air quality in northern California near the fires continues to be unhealthy. When wildfires burn, they let off particulate matter. These tiny toxic particles can make their way into people’s lungs when inhaled. From there, they can make their way to the heart and pose all types of lung and heart problems. The California wildfires don’t show any sign of letting up, so we’ll have to see where their smoke winds up next.